Netflix Customer Service (CS) made a home in Utah. No, it wasn’t rough to recruit in the area. The challenge then? Hiring qualified candidates. 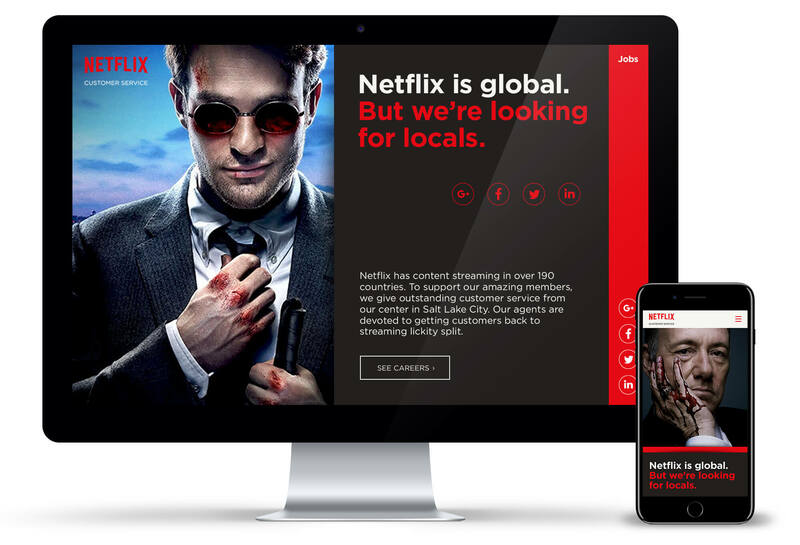 EKR created an integrated marketing and social media campaign that drives the right kind of local talent to Netflix CS. Everyone’s happier streaming on. Rightly so. Netflix CS is choosy about who they hire. Through research and targeting workshops, we distilled what we learned into extremely targeted personas—their perfect, lovable candidates. Still, these potential candidates needed to be humanized into personas before developing messages that connect. After getting inside a lot of heads, we brought the Netflix CS candidate persona to life. Loves helping. Keeps a cool head. Loves entertainment. Now to connect with those who wanted a Netflix career doing what they love. 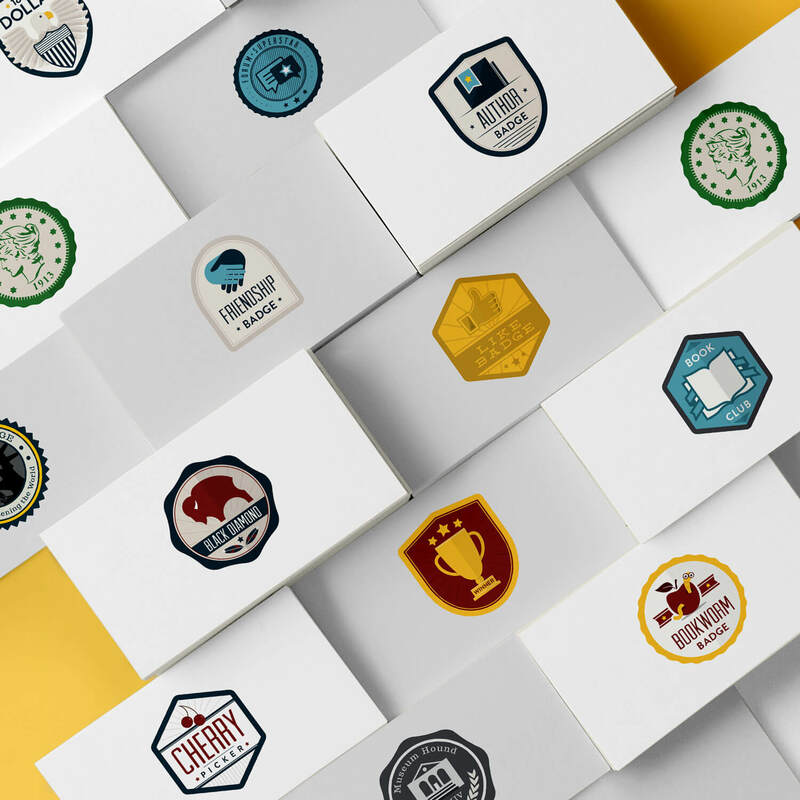 Coming out against mediocrity, we developed messaging designed to qualify applicants that fit with the entertainment giant’s brand. Casting SLC’s best and brightest. If you’re as two-faced as Frank, maybe you shouldn’t work here. Ignore this ad, if you’re as awkward as Tobias. Netflix is global. But we’re looking for locals. Service runs in our bloodline. 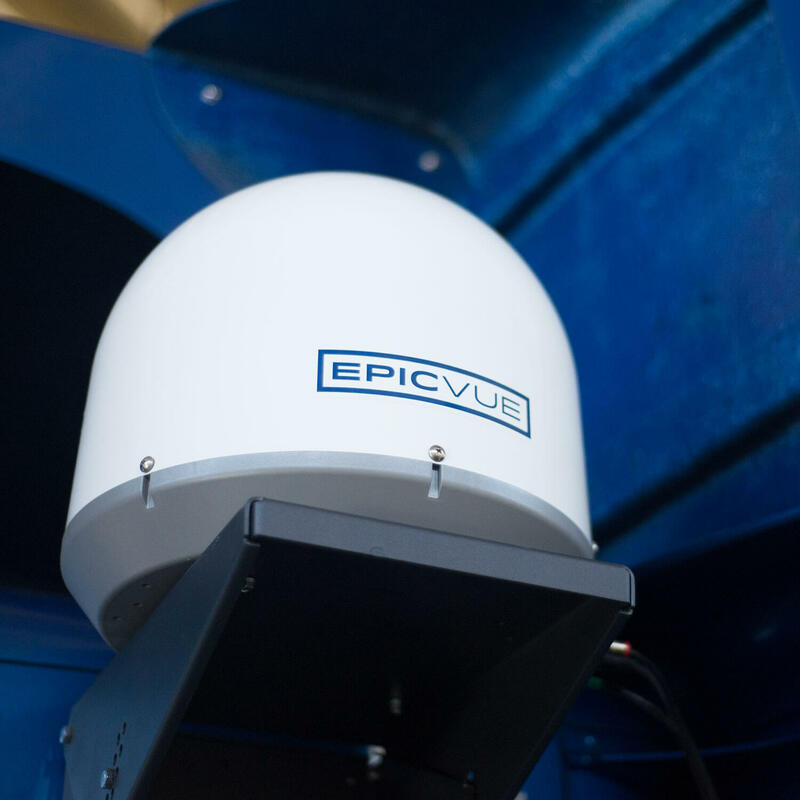 As an integrated campaign, our content strategy team created a plan to connect the whole story—billboards, social, website landing pages, all with a unified and deliberate goal to get the right candidates in the door. Potential recruits don’t expect corporate. Especially when visiting a Netflix website. But that’s what they got with the old Netflix CS site. Corporate. Our charge was to make the site more inviting for users. 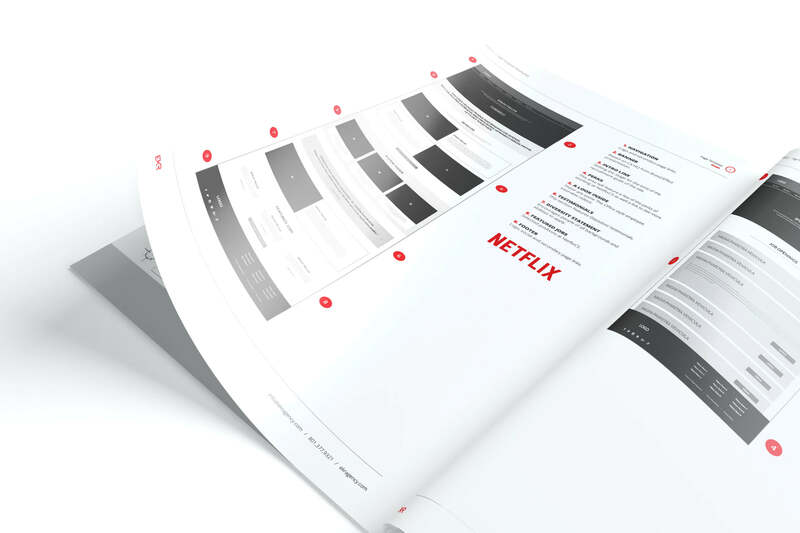 Even push the existing Netflix brand style guide to new heights. 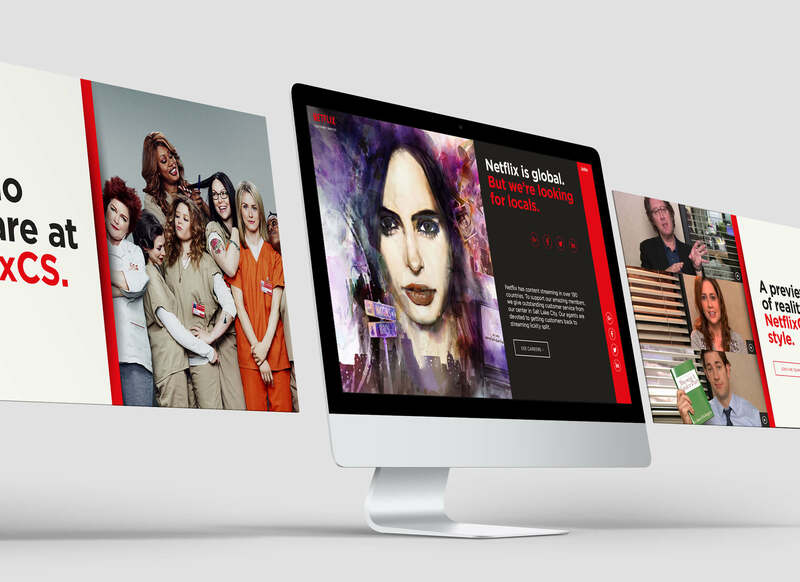 Exploring modern animations and user-centric design, we created a simple interface and experience for the Netflix CS website. Not corporate. More Netflix. 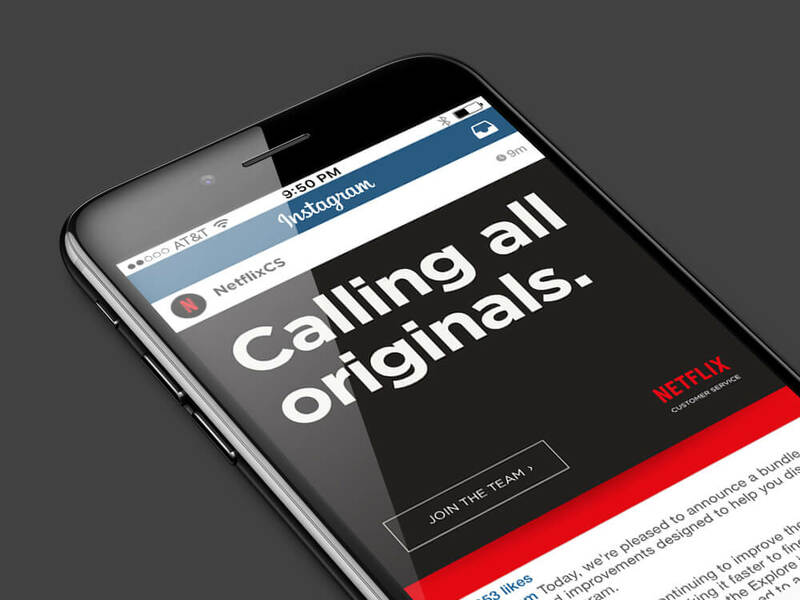 Users (specifically potential candidates) now have a place to land and say, “Hey, this is the Netflix I would love to work for.” We were given liberty to use existing brand assets, and liven up the site and incorporate the entertainment and original programming to encourage visitors to apply for a position with Netflix CS. 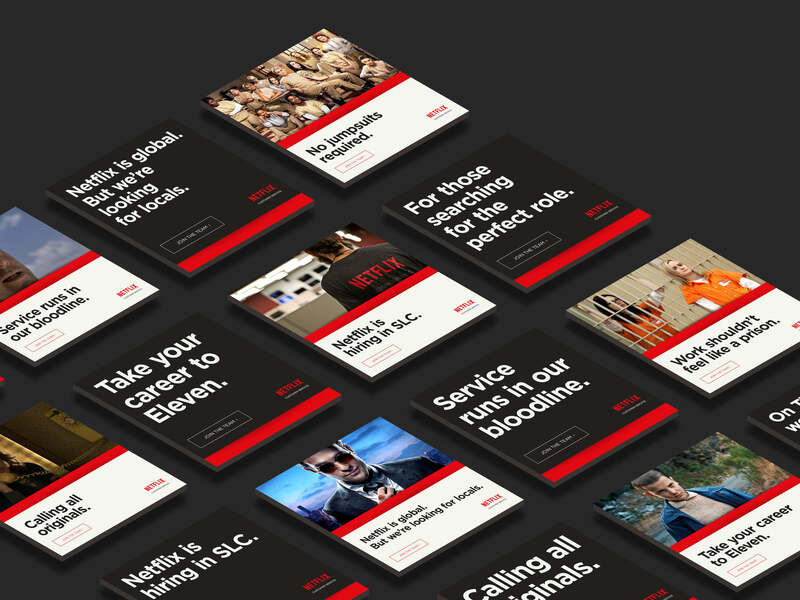 All in all, we put the finishing touches of the campaign and added something new to the Netflix brand, a great example of how small pivots within larger parent brands can influence progress without breaking things. A new start for Netflix CS, but not so much for the Netflix brand. We created an on-style design and developed to the expected excellent standard with all the lastest in mobile responsiveness and interactivity. This wasn’t a campaign that required a strategy at the national or even state level. Our social strategy aimed to engage a more finite demographic at the county level. 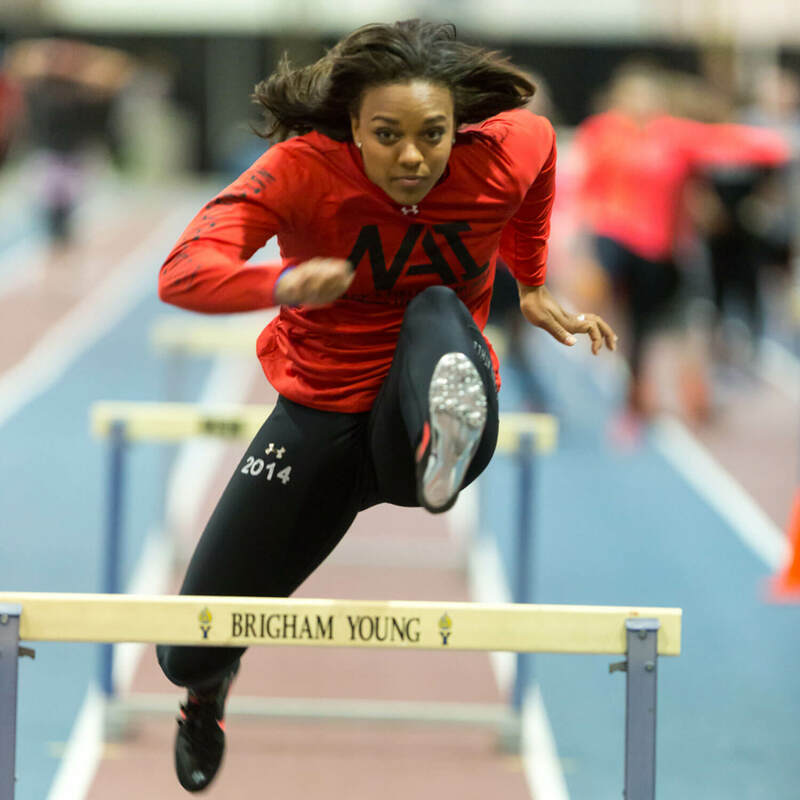 The goal: Get the message out to Salt Lake County, Utah. 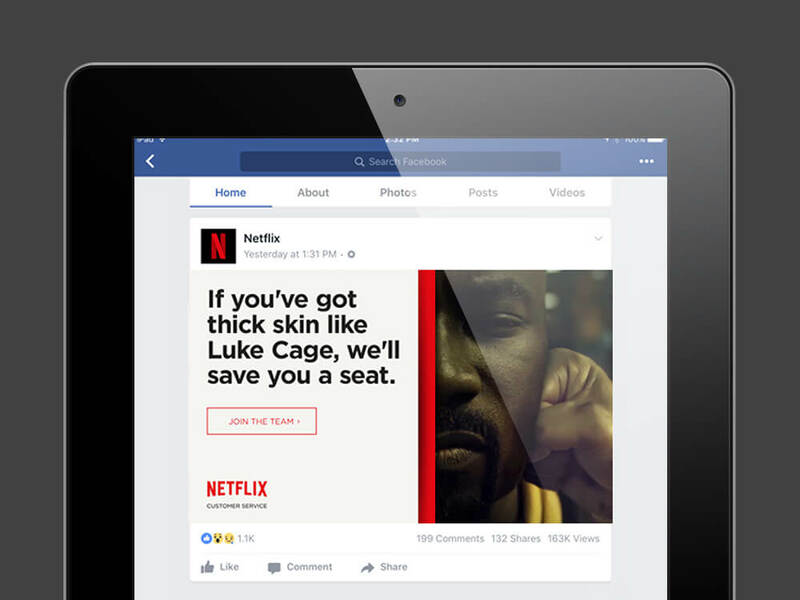 And encourage social sharing that drove interested, more qualified candidates to the newly developed Netflix CS website. Our media buying included pay-per-click advertising but weighted more heavily on Instagram and Facebook advertising. Why? Our target, in their 20s and 30s, live on those platforms. Time for the ads to hit the screen. 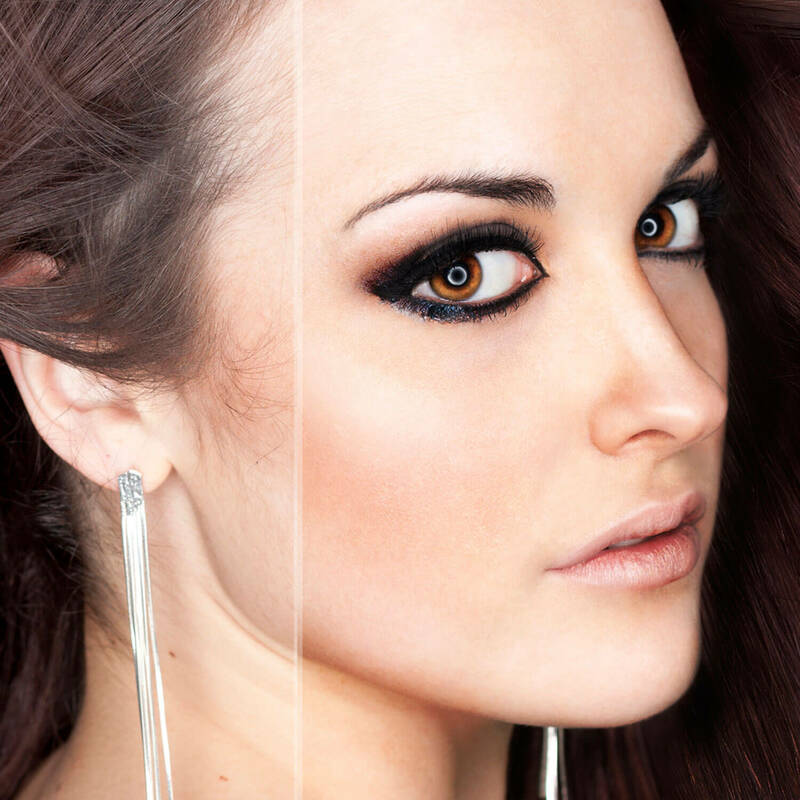 Our copywriters and designers extended the branding and strategy into engaging, well-executed visual ads. To click or not to click? Not a questions when ads are this irresistible. So successful that Netflix has invited us to help out in the local markets of several international offices. Some numbers on the social media campaign: Running 20 ads, we reached over 132,500 of our targeted audience with a 17% clickthrough rate—not to mention the top ad had just under 90 shares (pretty great for a county-level campaign).